Like all good agile teams, we've been making some steady and incremental improvements to the transition programme and processes. Most of our changes have been made to simplify our stages and to help us prioritise and track agencies and arm’s length bodies (ALBs) as they move through the programme. With a programme this large, it's easy to get overwhelmed by the size and scale of what we need to achieve. To counter that, we're always asking ourselves, "Am I doing the next most important thing?" If you've been through a transition workshop in the last week or so, you will have already received the updated processes and stage information. If it's been longer than that, however, it's worth taking a moment to familarise yourself with the updates to see how we’ve simplified the stages. To do: this is a list of all agencies and ALBs we haven't engaged with yet, or agencies who are applying for an exemption. Discovery: when you enter the discovery stage, we walk you through the steps and help you understand the transition process to GOV.UK. We also work with you to get an initial picture of the volume of content and traffic that your current site has. User needs: this is one of our most important stages in the transition. During this stage we'll work with your team to research, create and prioritise the content and services your agency provides. We include web analytics and qualitative user research throughout this process in order to put the needs of users first. We'll also provide writing style and Publisher training for your editors. Content analysis, build and publish: this stage is all about analysing, creating, transitioning and publishing content that is shaped around validated user needs. Redirect and decommission: when all the priority content has been created and published, we start archiving and redirecting old content, and decommissioning old websites if applicable. Business as usual: when your initial user needs are published on GOV.UK, it's not over! We're still here to support you and ensure your content is always improving and serving the needs of users. We removed a few stages such as 'planning', merged a few and we’ve added a few stages such as 'business as usual' to reflect a more agile approach. We are always planning and improving - and that goes for our transition process too. While your agency will eventually transition to GOV.UK, we will continue to improve our digital services for users. Our new stage names are now visualised on the transition programme wall here at Aviation House on the 6th floor. Where it makes sense, we've also broken our stages down into smaller columns to track milestones such as training sessions and workshops. 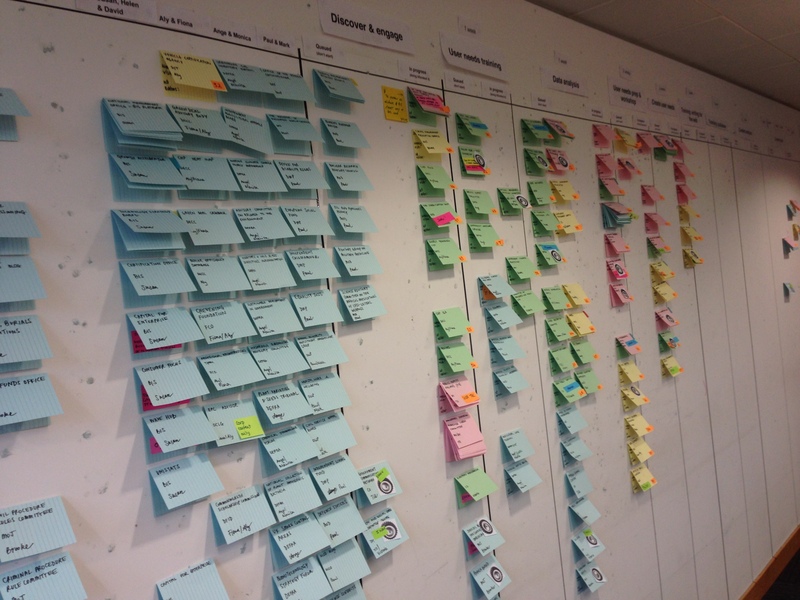 Within each stage, we have columns for 'queuing' and 'in progress' to help us regulate the flow of work for the team. We measure the time it takes for agencies to move through each from ‘queued’ to ‘in progress’ to extrapolate an average lead time and cycle time for each of our stages. As we move more agencies through the different stages, we’re getting faster and better. This data is an excellent source to help us estimate when an agency is likely to transition. We will continue to improve our processes as we progress through the programme. Keep reading our posts to stay up to date with these changes.